Whales in Thailand | How many species of Whales in Thailand? How many species of Whales in Thailand? Whales are truly magnificent creatures, and while you may mentally associate whales with the deep open ocean or seas in the colder regions of the plant, you will be surprised to know that Thailand has more than its fair share of whales and dolphins. 22 species of whales and dolphins are estimated to live in Thailand. The largest is the Fin whale which measures up to an impressive 27 meters in length. Other species found in Thai waters include the Killer whale, and multiple species of dolphins. 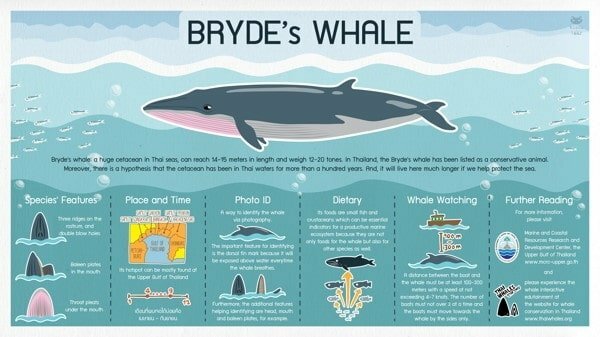 Although plenty of different species can be encountered in Thai waters, some are incredibly rare, however there is one whale species that can be encountered regularly, the Bryde whale. 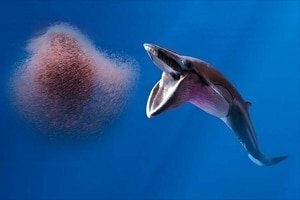 The Bryde whale is actually a name given to 2 species of whales. 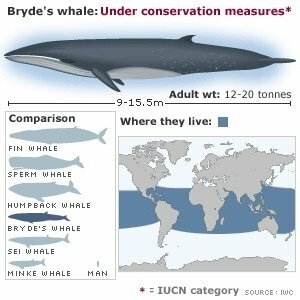 The common Bryde whale, named after Johan Bryde, is the larger of the two species, and is found around the world in temperate and tropical waters. The Eden whale is a smaller form of the Bryde whale, that gets its name from Sir Ashley Eden. Although small by whale standards, it is nevertheless a large marine creature and measures around 11-12 meters on average. 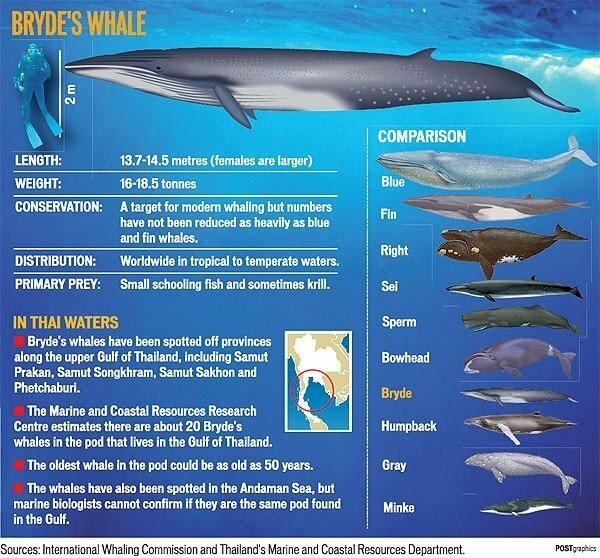 It is the Eden form of the Bryde whale that can be found in Thai waters. Eden whales mainly inhabit the Indo-Pacific regions and can be found all around the coast of southeast Asia. The Bryde whale is a baleen whale and belongs to the same type of whales as the Humpback and the Blue whale. The Bryde whale has two blow holes for breathing with a splash guard at the front of the most forward hole. Like other baleen whales, they have no teeth, but instead have two rows of baleen plates. These comb-like structures are used as filters when feeding, catching prey while allowing excess water to flow through them and out of the whale’s mouth. For whales, they have a very wide and varied diet; Bryde whales have been known to feed on a variety of fish, cephalopods, and planktonic crustaceans. The diet of Bryde whales will vary depending on their location around the world. Those present off the coast of Japan tend to feed on anchovies, while those present off the coast of California tend to feed on red herring. Those found in the Indian ocean including around Thailand tend to feed on shrimp and krill. The whales and calves can be regularly sighted in the Gulf of Thailand. Generally, it is estimated that females are pregnant for 12 months, and new-born calves are born around 3.4 to 4.0 metres long. A new-born calf weighs in at a whopping 1,000 kg. The birth of the calf is certainly not the end of the story. Bryde whales are very attentive mothers and will care and nurse their calves for a period of 6 to 12 months. Currently there is insufficient data to determine the exact status of Bryde whales, however they are listed in appendix I of CITES which prohibits international trade of their products. The species is also covered by various international treaties designed to protect its habitat and environment. It is also a protected species in the United States. 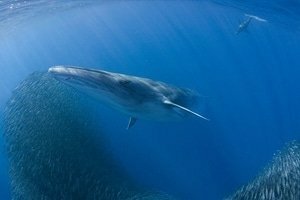 Historically the Bryde whale was not targeted by commercial whalers, although local fishermen in the Philippines and Indonesia have been known to target them. Luckily, due to the small scale of their operations, Indonesian and Filipino whalers have not had a drastic impact on the total numbers of the population. When it comes to accidental damage they do suffer occasionally from ship strikes, but they escape the far more damaging fate of being caught as bycatch; so far, no Bryde whales have been reported to be taken during commercial fishing. What is krill, since most whales seem to eat it? Krill is a generic name given to a group of tiny crustaceans. 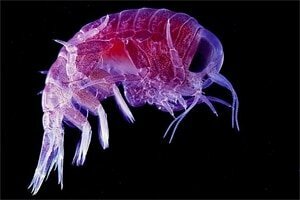 They are small shrimp-like creatures with the average adult being 1-2 cm long. They play a crucial role in the global food chain since they are located nearly at the very bottom of it. They feed on phytoplankton, and in turn become a food source for a huge array of fish and marine mammals. In terms of biomass, they are one of the largest biomasses on Earth, with an estimated biomass of 379 million tons—which ranks more than humans who have an estimated biomass of 350 million tons. Krill is crucial to life on Earth, and many species could not survive if it disappeared. Can I swim/dive with whales? Generally not, whales tend to be pelagic animals moving in deeper open water. They are too fast for you to keep up with, and don’t have the inquisitive nature of dolphins who can keep coming around time and time again to check you out. It is best to observe whales from the safety of a boat, where you can cruise and encounter various animals. In addition, it does seem that whales are somewhat attracted to boats, and will actually come quite close to check out the boat, which is when you get the best view of them. 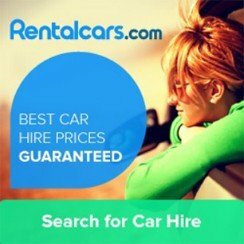 Where is the best place to see whales in Thailand? 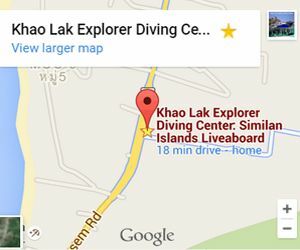 Sadly, the best spots for whale watching are not exactly close to the main tourist hotspots in Thailand. Whales mainly reside in the Gulf of Thailand and not on the West Coast. Although Kho Tao and Kho Samui are great diving destinations, you need to head up north to encounter Bryde whales. You need to head further north up the Gulf of Thailand to Samut Sakhon, Samut Songkhram, Samut Prakan, and Phetchaburi to encounter whales. These areas of the Gulf of Thailand have resident populations of Bryde whales, and Irrawaddy dolphins. 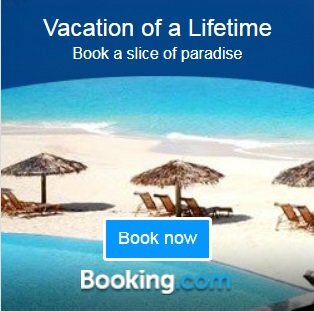 Accessing these sites is relatively straightforward and you can take whale watching tours from many locations including Bangkok. What other species can I encounter in the Gulf of Thailand? The Gulf of Thailand is home to 4 species of cetaceans (whales, dolphins and porpoises); you can find Irrawaddy dolphins, Indo-pacific Humpback dolphins and Finless porpoises alongside Bryde whales. Irrawaddy dolphins are similar in appearance to Beluga whales with a rounded head and no real snout, they average about 2.5 meters in length and large individuals can weigh up to 200 Kg. Indo-pacific Humpback dolphins resemble the traditional dolphin shape, and range in length from 2 to 2.8 meters, large individuals can weigh up to 200 Kg. These dolphins are a light grey with darker spots on the sides. The Finless porpoise resembles a Manatee or Dugong, but in fact it is a dolphin that is lacking its dorsal fin. These smallish cetaceans grow up to 1.5 meters in length and can weigh up to 45 Kg.